Accounting Professionals: Serve your clients - and your bottom line - better with ADP®. Hundreds of accountants across Canada look to the experts at ADP for secure, affordable, easy-to-use payroll, time and attendance, and human resource solutions for their clients. Not only can we help your clients save time and money, our experts can help you increase compliance, and reduce risk - giving you the time to focus on building your business. 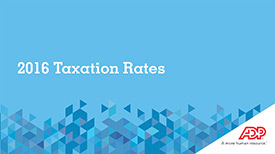 Check out ADP’s quick reference tax guide for all applicable provincial and federal tax information. When you refer clients to ADP, they get industry leading products and solutions backed by superior service from a single provider. They will benefit from a preferred discount and free implementation. There is even potential to earn revenue through our Shared Revenue Incentive Program. As a close trusted advisor, your clients turn to you for their payroll, tax filing and even human resource needs. You can leverage ADP’s solutions to help deepen and strengthen these relationships, help grow your revenue and increase client retention, turning payroll into potentially high margin service for your firm. Processing payroll can be a profitable business, but many firms find the administrative responsibilities and compliance requirements are too consuming to stay competitive, or take too much time away from other lucrative opportunities. Selling your payroll client base could help free up resources, generate capital or launch your succession plan. ADP can help. Watch this video to learn why small businesses are excited to partner with ADP. When referred by an accounting professional there are added advantages.